Like so many buzz words in the corporate lexicon, notions of agility get dropped often in work settings. Who doesn’t want to get the important things done faster? Even moreso, the Agile methodology, born and bred in the world of software development, introduces a welcome path to help get there. Well, no. Actually, it’s as difficult as can be. Because changing how we think, how we work together, and how we attack problems is painful, and sometimes slow. Agile champions and enthusiasts may beat the drum of change, but their energy doesn’t always sink in, or sustain. If Agile is a path to organizational and corporate agility, it’s going to be more of a journey. Agile is as much a mindset as a methodology. It’s not just the steps and the formats. It’s a social paradigm shift. Consider. How and when should we engage others? How do we get comfortable with ceding control? Are we able to develop a bias for trust? No small challenge, agility, but I think it’s the essential path. The 21st century marketplace demands a quickened pace. The nimble will survive. Q1. Quickened Pace. Can you and your team(s) pick up the pace of decision-making, even to the extent of a sprint? Q2. Flexibility. Will your and your team(s) be willing to shift direction midstream? Q3. Cross-Functional Engagement. What level of cooperation can you achieve? Q4. Commitment. Are stakeholders truly empowered to own solutions and take risks (vs. lip service)? Q5. Permission for Transparency. Is everyone (including/especially those “up the chain”) ready for honest appraisals of gaps? Q6. Flow of Work. Agility is fueled by an organic, opportunistic flow of work, not what we are used to: structure and control. Are you and your team(s) ready? Lots to talk about, all of it foundational to becoming agile. Let’s discuss, and put some stakes in the ground. The mission? We’re continuing to unpack the #futureofwork through the lens of social complexity, and I hope you’ll join us. We meet monthy, mostly on 3rd or 4th Mondays, from 9-11pm. For June, we’re holiday hopping, and it’s a 2nd Monday. See? We’re being agile already. Hold on for the ride. How does a Twitter Chat work? We recommend a streaming app like TweetDeck. Just append #orgdna to your tweets adding #orgdev #agile #agility and/or #futureofwork to specific tweets, as relevant, to expand the thread. Sometimes we’ll chat in the #orgdna stream in real-time, like a flash mob, with insights just popping up. But for the in-depth discussion, join us at the appointed hour on Twitter. It’s always lively, and we hope you’ll join us! Interest in Frederic Laloux’s 2-book series on “Reinventing Organizations” continues at #orgdna. His traditional 2014 business book favors the long form analysis with case studies, end notes, etc. The 2016 illustrated workbook introduces the concepts in a lighter-weight mode, ideal for visual learners .. and twitter chats. Try to find Laloux’s RO-illustrated (2016) .. we’ll be referring to it. RETHINKING VISION & STRATEGY. Laloux says our century-old predict-and-control mindset, rooted in ego, is the main force blocking better organizations. Obsessing on competition out of fear for survival, he believes, keeps us distracted. But he provides an alternative — Q1. How does a “sense and respond” change problem solving in an organization? EVOLUTIONARY PURPOSE. Citing Brian Robertson of Holacracy fame, Laloux references the analogy of a bicycle ride to describe the discovery and response aspects of adaptive leadership, new processes essential to a teal organization, so let’s ask — Q2. Can the modern company allow the destination, strategy & purpose to evolve? Will Wall Street entertain so much ambiguity? INITIAL CONDITIONS. For Laloux, two conditions are necessary for an organization to evolve: buy-in to teal principles from (a.) leaders and (b.) owners. Are both of these key groups prepared for risk taking, less structure and fundamentally new thinking? Laloux says it’s what’s needed to launch successfully, prompting — Q3. Is buy-in at the top enough, or is more required, such as an enabling culture? HOLDING SPACE. A new skill for teal leaders is bringing and sustaining focus, at least for awhile, amid the chaos that decentralized decision-making can bring, taking us to — Q4. How and when does a leader know to focus, and for how long must it be held? KEY ROLES. While teal CEOs make fewer strategic decisions, the need for leadership is stronger than ever, so — Q5. What current skills can be leveraged as today’s business leaders search for a path to new roles? A SIMPLER WAY. Laloux cites Wheatley, as many of us do, for providing breakthrough thinking on how orgs need to function, using the metaphor of an org as organism over the prevailing metaphor of org as machine. In the organic view, evolution and adaptation are integral to how things work, so let’s ask — Q6. Can new mindsets or metaphors influenced/sparked by complexity thinking help us re-imagine the organization? Much of this material we’ve covered in past conversations. But Laloux’s framework builds on the ideas in interesting ways, perhaps even actionable ones. I’m excited to find what we’ll learn from this, and where our dialog may take us. Please plan to join us MON 7/17 at 9pm EDT. We recommend a streaming app like Tweet Deck. Just add #orgdna to your tweets, and we’ll talk then. Many of us talk about change in our organizations, but few have been able to articulate a future state as clearly as Frederic Laloux. In Reinventing Organizations, he outlines a vision, examined both in historical context, and in contrast with other proto-evolutionary stages. For me, his comparitive approach is a useful mechanism to discuss a family of organizational cultures that are as familiar as they are dysfunctional. I was introduced to the work of Laloux by #orgdna chat member/leader Christy Pettit (aka @odguru). I quickly found his content consistent with the theme’s we’ve been discussing. Thanks Christy! Perhaps his most divergent, if not revolutionary, idea? Evolution driven by a next stage human of consciousness, further fueled by explicit linkages to complex adaptive systems. Echoes of Senge and Scharmer here of course. Definitely linkages to Wheatley. But there is some useful new thinking as well. Q1. Evolutionary Purpose. A core theme for Laloux. Are his ideas actionable? Q2. Teal, Amber, Red, et al. Do the colors used for Laloux’s organizational models resonate? Q4. Linkages to Complex Adaptive Systems. The implications for orgs and social change keep us wanting to learn more. How has Laloux advanced this? Q5. Forward. What happens next? Are leaders and their organizations ready? Lots to reflect on, for certain. And lots worth discussing. Please join us Monday, 5/15/17, at 9:30pm ET, as we discuss Laloux and his ideas. Just add #orgdna to your tweets at the appointed time. To allow conversation, we suggest a streaming app like Tweetdeck, to make sure you see the tweets as they come in. What is #orgdna !? It’s not just a hashtag. It’s a lively bunch of OD-minded change makers, congregating monthly to compare notes. I hope you will join us! Laloux, Frederic. Reinventing Organizations (2014). Nelson Parker. Mitchell, Melanie. Complexity, A Guided Tour (2009). Oxford University Press. Wheatley, Margaret and Myron Kellner-Rogers. A Simpler Way (1996, 1999). Berrett-Koehler. Peter Block: Better Questions for Orgs in 2017, moving from How? to Why? We’re kicking off our #orgdna conversation for 2017. For me, there’s no place better to start than a focus on the top questions facing orgs and their leaders. For that, there’s no better thought leader to tap than the purveyor of the better question himself, Peter Block. In late 2012, on the heels of getting my first book out, I read both of Block’s successful primers: The Answer to How, is Yes (2002) and Community: The Structure of Belonging (2009). Together they create an excellent structure for online conversation. Block’s ideas are 100% congruent with what I’ve seen in a variety of social Twitter-based communities. Careful question framing changes our ability to recognize new possibilities. Better questions lead us to a dialog on what matters most. Q1. Block argues “How?” bypasses questions of intention. Agree? Why? Q2. The right questions, Block says, are those that get us to focus on what matters. What are some examples? Q3. Flexible Structures. What are source/means for adaptive behavior? Q4. Learning Organizations. Inspired by Senge, how does this happen in +2017? Q5. Updated Guidance. Much has happened in OD since 2002. What would Block and others add to this dialog? Food for thought, without a doubt. And we’ll use our takeaways to fuel follow-on frames. Please join us on Twitter. The discussion will be MON 1/16/17, 9pm EST. We’ve been going about 90 minutes, as we work to accommodate multiple timezones and west coasters. Simply add #orgdna to your tweets. We recommend a streaming tool like TweetDeck, to follow the conversation. There will be more book-based #orgdna discussions in 2017. Besides, Block, we should look at Margaret Wheatley again, and most certainly others. Please weigh in on a proposed sequence. The only requirement is to keep the discussions practical and accessible. It’s okay to tap theories, as long as we don’t get stuck there. Hope you’re excited for the new year with #orgdna. Let the conversations and deep learning resume. In our monthly #orgdna chat, we’ve been discussing the future of the 21st century organization. Some have begun to rethink what is possible. Some have argued, as I have, that leaders should orchestrate their organizations rather than trying to control them, embracing more collaborative models for getting things done. Why? In short, dynamic models account for the need for organizations to respond to change. Adaptability is a requirement. And resources (e.g., information, people, funding) must be allowed to flow across department/functional boundaries when and where they are needed. Sadly, silos remain predominant. It’s what everybody is used to. It’s the 100-year-old factory model still being held up as the handbook for modern business. Think about any bureaucratic organization you’ve encountered. They are built in silos that sub-optimize elements at the expense of the whole. They embrace standards, at the expense of change. And perhaps worst, they are virtually programmed to survive. The good news: there are some alternative ideas and models in play that set out to change the rules, topics that are worth a deeper dive. So let’s have a look. In April, we looked at system thinking (link) as a means to model the structure and flow of the typical silo-based organization, to identify bottlenecks and counter-productive motivators. In May, we deconstructed the silo (link), looking at specific reinforcing flows that create problematic influences, beyond our best intentions. Now, in June, it’s time to look at silo improvements, exploring alternatives to challenges and gaps we’ve identified. Let’s start with a picture to get us thinking, a visual prompt for ideas that can be complex and abstract when left to words. Q1. Restoring Critical Feedback. Adaptation depends on a critical feedback loop, and in silo’d orgs this is often blocked. What new mechanisms could allow feedback to flow across and within silos? Q2. Freeing/Reallocating Critical Resources. We’ve all seen hoarding of financial and human resources within silos produce a negative outcome. What can be done to prevent or discourage this? Q3. Solving Fragility for Resilience. We’ve learned silos that hone deep expertise are fragile or obsolete when demands change. 21stC forces demand adaptability; organizations are seeing shifts in their markets and technology base; operating units must learn to function under new rules. This can be the most daunting kind of change of all. How do we foster adapability and a new resilience? Q4. Optimizing for the Whole. The classic negative silo-driven outcome is optimization at the department or component level, while hurting the larger organization. What is needed to circumvent this self-defeating path? As we discuss alternatives, let’s continue to use system thinking as a guide. What forces are at work? What controls are increasing, decreasing, or blocking the flow of critical resources? How might these be influenced? The #orgdna community meets monthly on organizational learning and leadership, typically 3rd MONDAYs at 10 pm ET. Simply sign on to Twitter at that time, and use the hashtag #orgdna to follow the conversation. If you can’t attend, the transcript will be captured in PDF form and linked in a comment to this framing blog post. Prior transcripts are available in a similar fashion, as comments on the respective monthly post. It’s always a lively exchange. All are welcome. We hope to see you there. I had a fascinating exchange Saturday morning with Panteli Tritchew and Ken Gordon, sparked by a response from Mike Itzius. It was a spontaneous twitter chat (sometimes called ‘async’) that sparks from a tweet or two, aided by twitter-enabled phones with alerts on audible. We brainstormed a few threads that run through the modern organization. Even in our short dialog, it was clear: there are so many interrelated threads, it can be hard to know where to start. 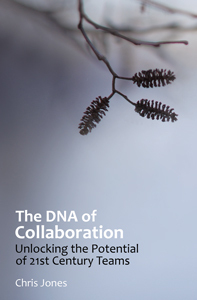 That’s been a challenge for #cdna too, as it’s long been for leaders. Where does change in an organization begin? Since mid-2012, a group of us have chatted on these topics under the concise but obscure #cdna hashtag. The tag was short and sweet and it served us well. But with conflicting use now among genetic scientists and stock market traders, we need a new moniker. In our impromptu Saturday chat, we touched on organization development (“OD”), change in general, and the various aspects of learning that weave in and out of these sometimes academic topics. We didn’t mention, but have in the past, culture, the forces of social complexity, knowledge management (“KM”) and of course, the overarching umbrella of leadership. Those topics often get woven into our chats. Together, they are the fabric (resilient or otherwise) of the 21st century organization. Add all that up and it’s one whopping hashtag. But we must find a new one. A hashtag to focus the conversation must foster freedom and independence of new ideas. We can tap other tags (and their stakeholders!) as specific topics afford. I’ve found #orgchange #orglearn and #orgdev all have links back to individuals or corporate initiatives, and some great content. Tags like #leadership and #change need no introduction. We just need a twitter place to call our own. Q1. Org Change – the action or the destination? Q2. Org Leader – the critical catalysts? Q3. Org Development – the practice and the mission? Q4. Org Learning – the capacity .. & the missing link? Q6. Org Culture – the ultimate enabler? I hope you can join us MON 7/20 at 9:30p ET, 6:30p PT. We’ll take on each thread one by one, to see what kind of magic we might weave. By the end of the chat, we should have clarity on our new hashtag. Until then, we’re still #cdna ..